Torq Energy is a drink that has been carefully formulated to satisfy the energy needs of performance athletes and physically active people. It contains carbohydrate to top-up your energy reserves and replaces the five electrolytes that you lose through sweat. The formulation uses a 2:1 blend of maltodextrin and fructose for increased carbohydrate delivery and utilisation. You get an instant energy hit from the maltodextrin, then a sustained energy release from the fructose. 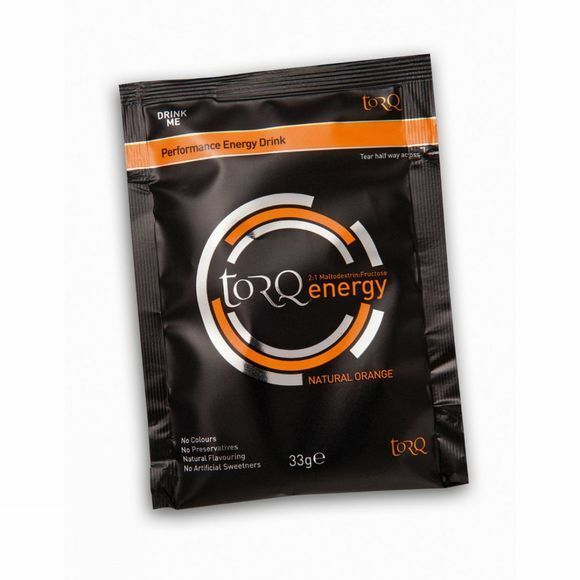 You can use Torq Energy as part of the Torq Fuelling System. Mix a 33g sachet with 500ml of water to create 1 Torq Unit. Research shows that individuals can absorb up to 3 Torq Units per hour whilst exercising, although Torq recommends that newcomers and smaller individuals start with 2 Units and experiment with higher doses over time. In warm conditions, or during high intensity exercise, when your perspiration rate is high, they suggest that you lean towards a greater intake of Torq Energy Drink. In cool conditions when hydration is less of an issue, more of your fuelling units should be delivered via Torq Gels and Bars. Maltodextrin (glucose polymers 60%), fructose (30%), citric acid, natural flavour (3%), electrolytes (sodium chloride, calcium lactate, potassium chloride, magnesium carbonate).